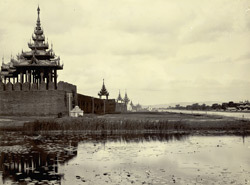 Photograph of the moat and city walls at Mandalay, Burma (Myanmar), taken by an unknown photographer in the 1890s. Mandalay, the second largest city in Burma, was founded in 1857 by King Mindon Min (who shifted his capital here from Amarapura) and became the country's last great royal capital. The city was built as a palace-fortress in the form of a perfect square with walls 3 km (2 miles) long, surrounded by a 70m-wide moat on all four sides. This is a view of the moat and city walls which are crowned at intervals with ornate wooden watchtowers. These are built in the form of tiered spires known as pyat-thats, which demarcate sacred royal or religious space in Burmese architecture. When Mandalay was annexed by the British Empire in 1885 after the Third Anglo Burmese War, it was renamed Fort Dufferin and a military cantonment was built inside the walls. The photograph is from an album devoted almost entirely to Lord Elgin's Burma tour of November to December 1898. Victor Alexander Bruce (1849-1917), ninth Earl of Elgin and 13th Earl of Kincardine, served as Viceroy of India between 1894 and 1899.